The day of love is upon us, and whether it’s a blowout, gourmet dining and red roses affair that you’re after, or more of a budget yet super tasty experience for the two of you to enjoy, we’ve got you covered. As well as all’onda’s stunning Palm Jumeriah location, the show stopping Valentine’s Day menu is set to impress, with rock oysters and arancini to start, Wagyu beef with jumbo tiger prawn and spaghetti carbonara with truffle for main course, and for a truly decadent finale, dark chocolate budino with blood orange gelato and green tea-misu will be served for dessert. all’onda is also offering special rates on rooms and spa experiences. Check out the website for more information. Details: The Valentine’s Day menu will be available from 5pm-10pm on Thursday 14th February. AED 500 per couple for a sharing menu. To book, call 04 248 8870 or email reservations@allondadxb.com. Spice up your Valentine’s weekend in a majestic Mughal era, styled in warm colours and ornate tapestries at Khyber. Be welcomed with a refreshing mocktail served upon your arrival and enjoy a four-course set menu of exotic Indian cuisine. Details: AED 360 per couple. The set menu will be served between 6pm-11pm on Thursday 14th February. To book, call 04 455 1111. This Valentine’s Day, The Retreat Palm Dubai invites lovebirds to dine under the stars, with the glittering nightscape providing a romantic outdoor setting. Guests can indulge in an array of culinary delights with a specially curated four-course menu served on the scenic pool deck overlooking Palm Jumeirah. With the exclusivity of nine tables only, paired with the serenity of the property, advanced bookings are a must with this one! Details: AED 350 per couple. The set menu will be available throughout February from 7pm-11pm. To book, call 04 524 7777. Setting the scene for a casual/down-to-earth atmosphere, be transported to the street lamps and cobblestones of France and let romance take over while enjoying great food this Valentine’s. Couqley’s signature Steak Frites is the pièce de résistance, along with homemade ravioli, and escargots de Bourgogne. End the French amour feast with a Couqley’s classic Pain Perdu, the original French toast (aka forgotten bread). Celebrate San Valentine in the romantic ambiance of BiCE Ristorante. Indulge in a four-course set menu with your loved one, raise a glass for everlasting love and listen to the soothing sounds of piano music. With dim lights and candlelight setting inside and an opportunity to dine under the stars at the terrace, this will truly be a night to remember. Details: Priced at AED 225 per person for a four-course tasting menu plus a glass of bubbly. To book, email bicerest.jumeirah@hilton.com. Spoil your other half as you both indulge in a special four-course menu under the dreamy, moonlit sky. Take in the stunning views of Burj Khalifa while Cabana’s resident DJ and violinist set the tone for your evening. You can also opt for a private cabana to add exclusivity to your evening. Nestled on the white-sand beach, rediscover your love by the sea – al fresco style – as Palm Grill serves up a tempting Mediterranean inspired four-course set menu, starring the freshest collection of premium seafood to start, surf and turf for main course and rich chocolate raspberry dessert. You’ll also be able to savour island inspired beverages, live tunes and the natural background music of the water breaking on the beach’s edge. This Valentines’ Day, Scalini Dubai celebrates love with an enticing evening meal, served within its relaxed and refined ambiance. Inspired by the romance and glamour of Italian culture, Executive Chef Monserrato Marini has curated three courses of signature dishes, designed to create a magical and romantic evening for each and every couple. Choose from the classic avocado caldo, creamy Burrata; or the carpaccio pizza to start, before having the options of heart shaped ravioli with burrata and a tomato sauce; sliced fillets of veal with a mushroom sauce and grilled vegetables; or a fillet of seabass served on a bed of cauliflower puree and pesto for mains. To finish, choose from a raspberry Charlotte, a cheese flan, or a heart shaped Tiramisu, created especially for the celebration of love. Details: AED 340 per person. To book, call 04 349 0068. Embark on a romantic cruise around a private marina on the signature Divaz boat in JA The Resort. Indulge in a sumptuous 5-course dinner menu featuring Boston Lobster, Aged Filet Mignon or Black Cod and bottle of grape per couple. Enjoy live entertainment with an acoustic duo as you take in the sights and then make a night of it with an overnight stay with romantic turndown, breakfast and guaranteed complimentary room upgrade. What better way to end a romantic evening than with a gondola river cruise this Valentine’s Day? At Lapita, Dubai’s only Polynesian destination, guest will be led to a specially created al fresco dining venue, before a gourmet dinner is served under the stars. Then, guests are then driven via the stunning gondola to enjoy dessert as they take in the sights and sounds of Riverland. Couples can also turn it into an overnight staycation for an additional cost, which includes bespoke Hawaiian treatments at the hotel’s stunning spa and breakfast the next morning. AED 795 per couple including a 9-course set menu and two glasses of bubbly. Details: AED 795 per couple including a nine-course set menu and two glasses of bubbly. To book, call 04 245 5555 or visit www.wdubaithepalm.com for more information. Nestled among the peaceful, winding waterways of Madinat Jumeirah, Pai Thai offers a truly authentic Thai experience served bursting with flavours. The venue will be decked out with dreamy Valentine’s decorations on February 14th, while Wanthakan (the venue’s professional Thai dancer) will be on hand to entertain guests throughout the evening. All packages include a five-course dining experience; a welcome bouquet for ‘her’; and a soap carving experience that offers guests a souvenir for the day. Details: Reservations available from 6pm onwards. Prices start at AED 1,500 per couple for the silver package. For more information or to make a booking, please email JRGReservations@jumeirah.com or call 800666353. Nestled within the heart of The Restaurant lies one of the city’s most exclusive dining venues, The Secret Room. Treat your loved one to a decadent, five-course dinner, complemented by sommelier-paired beverages, as you enjoy one of the most private and exquisite Valentine’s Day dining experiences in the city. Indulge in a private chef’s table in an intimate environment, and with an option to choose your own playlist for the evening. Hell’s Kitchen is giving couples a flaming Valentine’s Day with Gordon Ramsay’s signature five course dinner set menu. 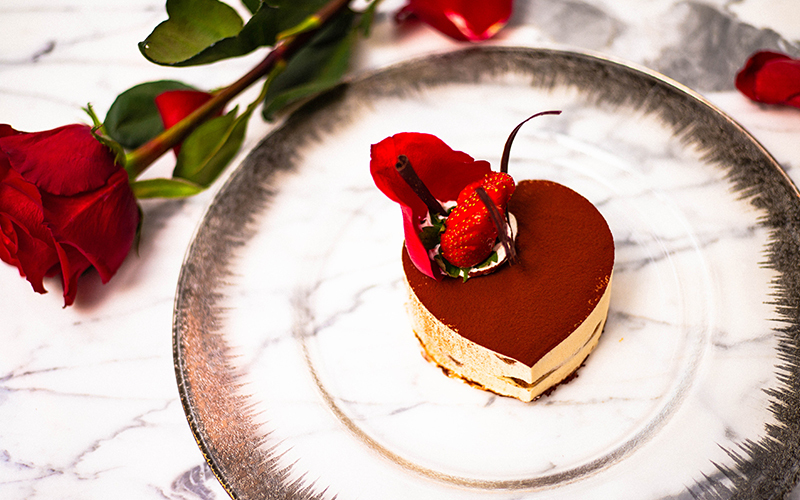 The Valentine’s offer includes a glass of bubbles, the finest of oysters and selection of Gordon Ramsay’s signature dishes such as the beef wellington, as well as an exclusive Valentine’s sharing dessert and complimentary chocolate truffle hearts for the ladies. Nestled away from the bustling city and surrounded by pristine sands and glistening waters, the private gazebos at Park Hyatt Dubai create the most intimate setting for a Valentine’s celebration. Candlelit ambiance, romantic table and flowers will welcome guests for the ultimate three course meal. Details: AED 1,950 per couple, inclusive of a three-course meal, a glass of sparkling on arrival, a flower bouquet and a gift. To book, call 04 602 1234.